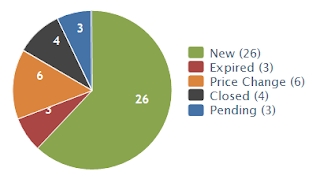 The chart shows the market activity in Darien in the last 30 days based on information from the MRED Multiple Listing Service. There are currently 108 active listings of detached single family homes as of 07/29/2010. In the last 30 days there have been 4 closed sales. At the current rate of absorption there are 27.00 months of unsold single family inventory in Darien. This level of inventory is considered an over supply. Thanks for providing this information,i was searching about these figures.Thanks for sharing. Chicago housing market covers a large area, and if some parts of the market sees a recession, while others argue quite well. Even within a given region, you can see houses in a price range that moves well, but the house at a higher price to not sell.